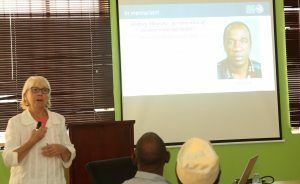 (Dar es Salaam) London School of Hygiene and Tropical Medicine (LSHTM) professor Wendy Graham has paid tribute to the fallen seasoned public health scientist and former Ifakara Health Institute (IHI) Deputy Director, Dr. Godfrey Mbaruku. Prof. Graham was in Dar es Salaam – IHI Mikocheni offices in particular – during the week of September 24-28, 2018 to officially launch a study known as ‘Clean’ whose local Principal Investigator is IHI’s Dr. Abdunoor Mulokozi. The don spent a couple of minutes revisiting Dr. Mbaruku’s legacy during her scientific talk, addressed: “Improving maternal and newborn survival: opportunities and challenges in sub-Saharan Africa” she gave on Friday September 28 in the IHI’s Mikocheni Main Conference Room. “In 2010, The Lancet profiled Godfrey Mbaruku as an early hero of modern maternal health,” noted Prof. Graham in her special memoriam message. She brought to the talk some copies of the internationally acclaimed journal (Vol 375 June 5, 2010) and distributed to attendees of the talk. Dr. Mbaruku died at his Mbezi Beach home on Sunday morning September 2, 2018, leaving behind a legacy of over 30 years of service in the field of maternal and new bourn health in Tanzania and abroad.